Plot: A young woman is involuntarily committed to a mental institution, where she is confronted by her greatest fear–but is it real or a product of her delusion? Tagline – Is she or isn’t she? Story: Unsane starts as banker Sawyer Valentini (Foy) dealing with the consequences of being a victim of a stalker decides to go and see a doctor to talk through the problems, Sawyer signs the paperwork and finds herself being committed to the mental institution, trying to figure out how to get out of the institute. As Sawyer tries to play by the rules to get out quickly, she starts to believe her stalker David (Leonard) works at the institute which doesn’t help her case about whether she is crazy or not. Characters – Sawyer is a banker that has recently moved to a new city to start a fresh life after keeping her stalker problems a secret from her mother. Just looking for help to talk to about the problem and the recovery process, she soon finds herself locked up in a mental institute where she must try and prove that she isn’t insane and to make matters worse, she believes one of the nurses is the stalker, with nobody believing her. David is going by the name George and works as a nurse in the institute, he has been following Sawyer for years now, willing to do anything to Sawyer, the biggest question mark about this character comes from the fact we don’t tease about what he is playing more into the maybe Sawyer jut being crazy. Nate and Violet are patients that are both supporting and against Sawyer and her action within the institute. Performances – Claire Foy is fantastic in the leading role, we believe how she is being treated needing to search for answers, while felling helpless to everything going on. Joshua Leonard is disturbing in his role too, he makes us feel uneasy whenever he is on the screen. As for the rest of the cast, they are given less to do and even feel natural in all their actions through the film. Story – The story shows how one woman’s life is turned upside down after dealing with a stalker situation, she has tried to move on with her life and looks for support from professionals only to find herself trapped in a mental institute with a man she believes to be her stalker. Now there are two ways to judge this film, first is the excellent way it portrays the victim stalker relationship, the effects it has on the victim and how silence has only made it difficult for anybody to believe the story. the weaker side of the story comes from telling us upfront that David is the stalker and watching his actions, the idea that the woman in the institute could be crazy would have only added an edge for the story which would have been nicer to see, though it could also be praised for showing us both sides of the victim/stalker relationship with the people around them not knowing the truth only dealing with what is appears to be on the outside. Horror/Mystery – The horror in this film comes from an angle we don’t see often, we follow a victim of stalking that doesn’t have anybody in their life supporting them anymore, just as the stalker catches up with them, with the cause and effect putting her own life in danger. The mystery is a side story that would be easy to forget was being part of the film, it focuses on the idea of how the hospital is being run. Settings – Most of the film is set within the mental institute, which shows how difficult it would be to get anybody to believe what is going on within the film. That Moment That Annoyed Me – Giving away that he is a stalker rather than playing of the ideas Sawyer could be crazy. Final Thoughts – This is a disturbing horror, that will make you think twice when somebody claims to have been a victim of a stalker, because unless you lived through it, you will never know the trauma it will cause the victim, and this shows what happens when nobody will listen. Plot: A young, abused and timid 17-year-old girl discovers she has telekinesis, and gets pushed to the limit on the night of her school’s prom by a humiliating prank. Story: Carrie starts with an all girls gym class and we meet our social outcast Carrie White (Spacek) who ends up not understanding about her first period, leading to all the other girls taking a chance to bully her, but in this scene we get a first glimpse of what Carrie is capable of as she blows out the lights in the locker room. Carrie is controlled by her high religious mother Margaret (Laurie) who believes that Carrie is constantly sinning and when she does she punishes her. Carrie is learning about her telekinesis while the other girls including the old friend Sue (Irving) and Chris (Allen) suffer through detention for what they had done to Carrie. When Sue tries to make up for the prank she gets her boyfriend Tommy (Katt) to ask Carrie to the prom, but Chris ends up seeing this as a chance to work with her boyfriend Billy (Travolta) that ends up causing Carrie to finally break. Support Cast: Carrie has a supporting cast that includes the bullies who plan the final prank but ultimately pay the price for their actions. Worst Part: There really isn’t one. Oh My God Moment: Prom scene. Chances of Sequel: Has one. Oscar Chances: Nominated for two Oscars for Best Actress in Leading and Supporting Roles. Tagline: If The Exorcist made you shudder, Carrie will make you scream. Overall: Classic horror film that put Stephen King one the map. 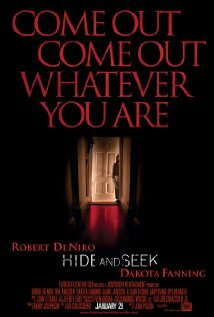 Story David Callaway (De Niro) and his daughter Emily (Fanning) move to a quieter town after his wife’s (Irving) suicide. Emily witnesses the body being found and his in shock. Emily way to find an escape from what happened creates an imaginary friend Called Charlie. David tries to move on with his life meeting all the different locals Elizabeth (Shue) Sheriff Hafferty (Baker), Laura (Leo) as well as keeping updates on Emily to Katherine (Janssen) back in the city. Things take a turn for the worse when Charlie starts making things happen while David is sleeping. David thinks Emily is just reacting to her mother death but could there be a more surprising truth? Verdict This horror thriller has a big name cast and it backs that up with some good jumps and a great tension story that will keep you guessing right up to the end. Even if you didn’t like the end the DVD offers a few alternative endings. The atmosphere created is very effective and De Niro as the concerned father comes of well after being used to his other roles through out the years. As for horror thrillers this is a good addition to the recent collections and well worth a watch for all fans of the genre. Star Performances Dakota Fanning as the traumatised daughter with a secret. Worst Part They should have picked one ending and stuck with it instead of so many different ones.